28. 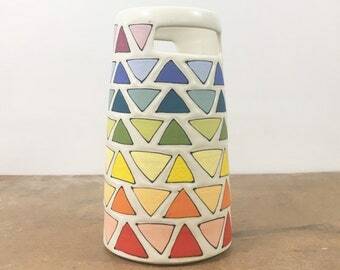 Large Rainbow Bird Vase. 7.25 inches tall and 4 inches wide. 29. 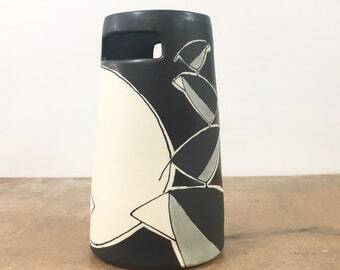 Large Nighttime Black Bird Stack Vase. With full moon. 7.25 inches tall and 4 inches wide. Announcement NEXT SHOP UPDATE: March 15th at 10 am PST! I am currently only listing ready to ship work. If you have a question about pre-sale availability please message me. NEXT SHOP UPDATE: March 15th at 10 am PST! Teeny Tiny Muggie Earrings. Small. Stainless steel stud with stabilizer backs. Mug. Take a deep breath. Morning coffee will never be the same! Love my new mug. 11. Large Rainbow Bird Mug. 20 oz. Came very quickly! Wonderful mug! 17. Small Rainbow Bird Mug. Black with full moon. 14 oz. I'm so excited to see this Melissa Maya Pottery mug on the cover of Delicious Living Magazine! PRE SALE 4-6 weeks. Black and White "Practice Happiness" Message Mug. Message mug. Typographic mug. Minimal. Pottery. Modern. Affirmation. Using my belly while I decorate some pots. It's mostly a nice table to rest a pot, except when that table starts to kick. Medium Black and White Chevron Planter. Indoor garden. Herbs. Modern home decor. Drainage hole and dish. Gift. READY TO SHIP. READY TO SHIP. Set Of Three Small Black and White Geometric Planters. Modern. Handmade porcelain planters. Drainage hole. Everything you see here in my shop is handmade by me from beginning to end here in my basement studio in Idaho. I work in batches which typically take about 4-6 weeks, this is why my "made to order" listings say they will take 4-6 weeks to make. First I will take about two weeks to throw all of my work. This includes throwing, trimming the bottoms, pulling and attaching handles, etc. Anything having to do with the shape of the planter, vase, plate, bowl or mug. After the work is thrown and completely dry I fire it in my kiln in my garage for its first firing called a "bisque". During the bisque all of the water is removed and the pot becomes much stronger making it easier to handle for the next step. After they cool down I can take the pots out of the kiln and do any decorating. I typically will decorate for about one week. This is when I draw on the patterns with underglaze, do any brush work or splattering, or use wax resist to get the raw porcelain affect you see on my black mugs and planters. I spend a few days glazing all of my work. I make all of my own glazes here so if I need more glaze I will measure out all of the ingredients and mix up a new batch. Once everything is dipped in glaze and the bottoms are cleaned off I put them all into the electric kiln for their final firing. Two days later, when the kiln is cooled down, I will go back into the studio to unload the kiln. After that I will take about one week to take any photos, update my shop, and ship all of the finished pots off to their new homes! I'm a ceramic artist currently living in Idaho Falls, Idaho. I graduated in 2008 from Bowling Green State University where I got a BFA in glass and ceramics. After graduating I did some wandering around, lived in Costa Rica for a while, became a yoga teacher and then settled in Colorado where I started making again! I was in Denver for seven years growing my business and then moved to Idaho and brought the business with me. I live here now with with my husband, two little girls and pup making pottery in my basement. There is something wonderful about holding a handmade object. It's hard to put into words but we all know that feeling. I think it's a pretty good feeling. My hope is that these pieces will be fun and functional and bring a little happiness into your everyday activities like serving a meal, growing a plant, or having your morning coffee. I enjoy the whole process of making things out of clay, from throwing to trimming to decorating. I hope that the amount of joy that I get from making these pieces from beginning to end comes through while you are holding and using them in your everyday life. It makes me so happy to know that these pieces that I've put my time and passion into make their way to good homes where they will be loved. On Instagram use #mmpathome and #melissamayapottery with pictures of your Melissa Maya Pottery mugs, planters, dishes, etc. in use. I love seeing them in their new homes! Want to learn even more about Melissa Maya Pottery? Check out my interview on the Potters Cast, episode 326, titled "Mom and Maker". I also have another interview with Rebecca at Rebel Roads for her "Makers Gonna Make" series. Thank you so much for supporting this small business! I am a ceramic artist living in Idaho. I hope that the amount of joy that I get from making these pieces from beginning to end comes through while you are holding and using them in your everyday life. Enjoy! I would like you to be happy with your order. If you are not please contact me and we will work something out on an individual basis. I try my best to make sure things are shipped securely. If something is broken in the mail please send me a photo if possible of the broken item. All of my work is handmade and goes though several firings so there are a lot of opportunities for little differences between each piece. Because I am not a factory the pieces are not going to be perfect, they will have little wobble here or a little bump there. The glaze will be a bit different from batch to batch. This is the beauty of handmade work! Isn't it wonderful? I hope you enjoy the pleasure of holding something made by hand just as much as I do!